Realtors, lending and homeownership professionals, FHA is not the only option for Affordable Financing. 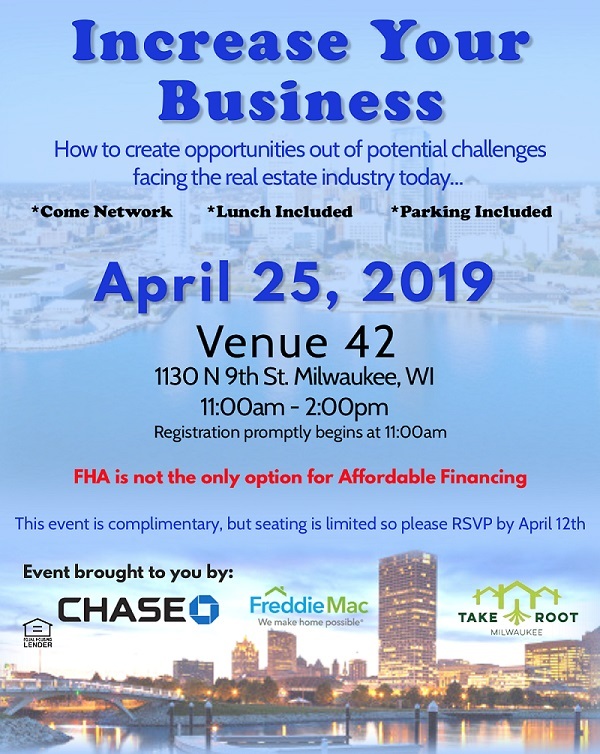 Please join Chase Bank, Freddie Mac and Take Root Milwaukee for a lunch & learn event. $2,500 toward a purchase with the exclusive Chase Homebuyer Grant. $500 for completing a homebuyer education course. Competitive interest rates on single-family mortgages. Low 3% down payment option, which can come entirely from gift funds. Reduced mortgage insurance coverage that can be canceled as you pay down principal. Attendees will have the opportunity to meet with Chase’s Milwaukee-area affordable lending team, learn about how you can connect clients to their products, and hear about Take Root Milwaukee – a consortium of lenders, Realtors, housing counseling agencies, and neighborhood and nonprofit groups dedicated to helping individuals and families connect to resources that can assist with buying, fixing and keeping a home. Registration is now open until April 18th!